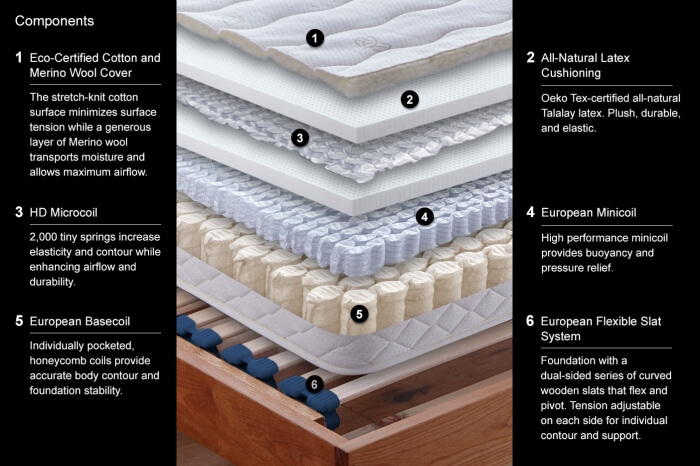 The Calico HDM is the top-of-the-line model of innerspring mattresses by European Sleep Works of Berkeley, California. It is a close equivalent of the Triple-Coil Model (Sonata) by Berkeley Ergonomics. The ESW model has ¼" more latex, while the BE model has more minicoils. The Calico HDM has 4,000+ coils overall, while BE claims 3,000+ in the Triple-Coil. Both models have 3 layers of coils (base, mini- and micro-), two layers of Talalay latex, and covers of organic cotton and Merino wool. 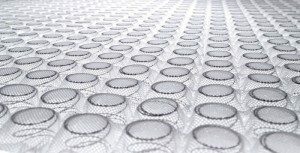 Primary support in the ESW Calico HDM depends on an innerspring of 1,300 European pocket coils in a honeycomb nested pattern. Pocket coils were invented about 1900 by James Marshall for pressure relief. This comes from their independent response—comformity over ¾ of a century before memory foam was introduced by Tempur-Pedic. Pocket coils also dampen motion transfer, reducing or eliminating partner disturbance. Just above the base coils is a layer of European mini-coils, also called "posture-fill microcoils." These are about ⅓ the height of the base coils. Whereas the base coils are nested, these are in a parallel grid, so the coil count is less, only 1,000, even with the smaller coil diameter. That makes this layer less firm, transitioning support to the more giving layers above. One of the two 1" Talalay latex layers is atop the minicoils. This is all-natural latex, made 100% from rubber tree sap. Latex foam (formerly called "foam rubber") is resilient, bouncy. Talalay latex is more breathable than Dunlop latex, and the firmness level can be more finely tuned. European Sleep Works offers a choice of overall firmness with the Calico HDM, and the firmness of the two layers of latex is the key. Between the two latex layers in the Calico HDM is a layer (or sheet) of 2,000 high definition microcoils. This brings the coil count in a Queen size mattress to 4,300. These microcoils are shorter than they are wide, which makes the microcoil sheet more flexible. The diameter of these microcoils is less than those in the Berkeley Ergonomics Triple-Coil Model. The cover of the Calico HDM is made of natural ingredients. The cover fabric and backing are organic cotton. The quilting material is Merino wool. The wool serves as both quilt cushioning and fire barrier. The Calico HDM is paired with a European wood slat base, the Flexible Slat System. The Calico HDM is available at the European Sleep Works store in Berkeley, California. It can be delivered to any address in Bay Area counties. 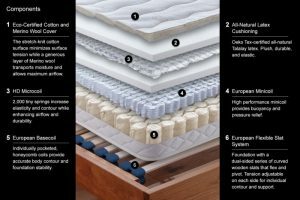 It is covered by European Sleep Works with a 10-year warranty.